Perhaps whey protein supplementation isn’t doing the trick for you. Trying a sustained-release protein formula such as MuscleTech PHASE8 could give you the results you’ve long wanted, as you’ll find out in this review. Seven high-quality protein sources. Combines fast-,medium-, and slow-absorbing proteins for maximum results. Twenty-six grams of protein per scoop. Yields a gaudy 52 percent of the daily value for protein. Solid calcium content. Forty-seven percent of the daily value for stronger bones and a healthier heart. Other Ingredients: Protein Blend [Whey Protein Concentrate, Milk Protein Isolate (Supplying Micellar Casein and Whey), Micellar Casein, Calcium Caseinate, Whey Protein Isolate 97%, Whey Protein Isolate, Hydrolyzed Whey Protein Isolate], Maltodextrin, Cocoa Powder (Processed With Alkali), Natural and Artificial Flavors, Gum blend (Cellulose Gum, Xanthan Gum, Carrageenan), Salt, Calcium Carbonate, Silicon Dioxide, Acesulfame-Potassium, Sucralose, Soy or Sunflower Lecithin. Directions: Mix 1 serving (1 scoop) with 8 oz. of cold water or skim milk in a glass or shaker cup. For best results, mix 2 servings (2 scoops) with 16 oz. of water or skim milk. Use between major meals and after exercise. Drink 8 to 10 glasses of water daily. For maximum results, consume 4 scoops daily for a minimum of 6 weeks. If you haven’t tried a blended or sustained release protein supplement, you’re missing out. If you want to grow serious muscle mass and remain in an anabolic state, this is the kind of bodybuilding product which should be right up your alley. Scientific studies back up our claim. “Our data and that of others further support the use of a blended protein supplement following RE (resistance exercise) compared with an isolated protein. A blended protein supplement containing sufficient EAA (essential amino acids) content, several digestion rates, and a prolonged aminoacidemia clearly promotes muscle protein synthesis during post-exercise recovery,” per the April 2013 issue of The Journal of Nutrition (via NCBI.NLM.NIH.gov). We’re hoping we can say the same thing about MuscleTech PHASE8. The manufacturer calls it its “Complete Sustained-Release Eight-Hour Protein Formula,” per its official website. “PHASE8 is a premium blended protein formula that feeds your muscles for eight hours. Each scoop contains an impressive 26-gram blend of milk-derived proteins that supplies a sustained-release of amino acids. PHASE8 has a superior, clean macronutrient profile with only half the carbs and fat of the leading competitor. The main protein component in PHASE8 has the unique ability to release amino acids in your bloodstream for eight hours after taking it. Because of these sustained-release properties, it’s a highly anabolic and anti-catabolic protein that helps create a muscle-building environment for longer periods of time,” per the same source. One of the keys to muscle growth is to feed your body properly. Supplementing with a sustained-release or time release protein blend such as MuscleTech PHASE8 should help promote anabolism for hours on end. MuscleTech PHASE8 has 26 grams of protein per 42-gram scoop. This gives you a solid 52 percent of the daily value for protein (for reference, a minimum daily value of 15 percent is high). This product has seven high-quality protein sources. “Overall, PHASE8 contains only high-quality milk-derived protein sources designed to digest at different rates, putting your body in the perfect state for repair and recovery. Unlike other protein blends, you won’t find any low-quality proteins like rice protein in PHASE8,” per its official website. Whey protein isolate is approximately 90 to 95 percent protein. It is lower in fats, carbs, and lactose content than its WPC counterpart. Thus, WPI is perfect for those who want to muscle up and lean out. Plus, it helps maintain muscular strength. The proof is in the pudding: “whey protein isolate supplementation elicited better maintenance of muscle strength in the days following contraction-induced eccentric muscle damage,” per the Journal of the International Society of Sports Nutrition’s September 22, 2010 issue. Long story short, if you want to maintain strength so you can conquer your fitness goals, consuming whey protein isolate after a hard workout is a good idea. As for MuscleTech PHASE8’s 97 percent WPI component (which you can also find in MuscleTech Lab Series 100% Whey Advanced), it’s one of the purest forms of protein you can find in any bodybuilding supplement. If you want more of the protein and less of the fats and carbs, this is a good option. We’re confident this component will help not only help increase muscle mass and strength, but shorten your recovery time. “Consumption of patent-pending, ingredient-optimized whey isolate (IoProtein®) not only provides a significantly increased benefit in lean muscle mass and strength but also allow athletes to recover faster from exercise and be easier on the stomach to digest than comparison whey protein supplements on the market,” per the Journal of Food Processing & Technology’s February 6, 2018 issue. 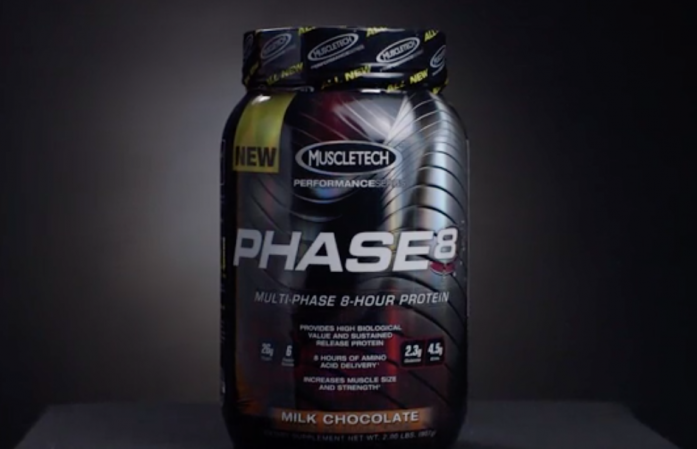 MuscleTech PHASE8’s third key ingredient is hydrolyzed whey protein. Simply known as WPH, this is an ultra pure form of whey protein. Here, WPI goes through an extra process called hydrolysis. This process breaks it down further. The end result: smaller particles called whey protein peptides. These have a faster absorption rate than regular whey protein. Furthermore, WPH also helps speed up exercise recovery. “There is evidence that protein hydrolysates can speed tissue repair following damage and may therefore be useful for accelerating recovery from exercise-induced muscle damage,” per the January 2010 issue of Journal of Science and Medicine in Sport. The key takeaway: MuscleTech PHASE8’s whey protein isolate and whey protein hydrolysate components should help increase your strength levels and shorten your recovery time. These are two crucial elements in any fitness program. It’s clear to us these proteins are not just about increasing muscle mass – they go above and beyond the call of duty. Whey protein concentrate (WPC) is the less pure form of protein at roughly 70 to 85 percent protein. It has a higher fat, carb, and lactose content than WPI. However, it has a higher immunoglobulin (a special protein which transports antibodies which ward off bacteria and viruses) content than whey protein isolate. Plus, WPC generally tastes better than WPI. The former is also cheaper than the latter. Some experts vouch for whey protein concentrate because it has higher-quality protein content (they argue WPI has denatured protein because of the extra processing it undergoes). Regardless of your choice, both should help you muscle up in conjunction with regular training, sound nutrition, and enough sleep. They should also help you recover faster and increase strength levels. Whey protein supplementation also helps keep free radicals at bay. The reason: it helps increase glutathione or GSH (a powerful antioxidant) levels. Three amino acids help synthesize GSH: cysteine, glutamate, and glycine. Experts have associated low glutathione levels to insufficient cysteine amounts in the body. Among the three aforementioned amino acids, cysteine is the one which increased glutathione levels depend on the most. “Whey proteins are a rich source of cysteine. WPC and WPI generally contain a concentration of cysteine that is at least four-fold higher than other high-quality proteins. Both WPC and WPI are shown in research to be an effective cysteine donor that maintains a concentration of active GSH (a favorable GSH: GSSG ratio) in cells. In comparison to other commercially-available protein sources, optimization of the immune response via enhanced production of GSH in immune cells has been achieved with whey proteins,” per the U.S. Dairy Export Council (via WheyProteinInstitute.org). It bears repeating: whey protein is more – much more – than a muscle growth enhancer. It also helps boost your long-term health. We’re pleased MuscleTech PHASE8 has both WPC and WPI. Researchers conducted a study involving 17 male subjects who were part of an experimental group. They performed resistance exercise and consumed one serving each of whey and casein protein immediately afterward. “Plasma peak concentrations of leucine, valine, isoleucine, arginine, total essential amino acids and total amino acids were higher after whey ingestion compared to casein ingestion. However, the plasma concentration of all these molecules remains elevated for a longer amount of time after casein ingestion compared to whey, at various extents,” per a 2011 issue of the American Journal of Physiology-Endocrinology and Metabolism (via EASAcademy.org). MuscleTech PHASE8’s fifth protein component is milk protein concentrate, a combination of fast-absorbing whey protein (20 percent) and slow-absorbing casein protein (80 percent). If you want a reliable source of sustained-release protein, milk protein concentrate is an excellent choice. Since milk protein concentrate has both fast- and slow-absorbing forms of protein, you can expect increased muscle protein synthesis and improved muscle mass preservation for seven to eight hours after consumption. Not only that, but milk protein concentrate is also a great way to make one feel satiated. “Data showed that MPB (milk-protein-enriched beverage) compared to CB (carbohydrate-enriched beverage) could modify daily eating habits by enhancing satiety in women with a stronger cognitive control of eating behaviour,” per the November 22, 2017 issue of Food Research International (via ScienceDirect.com). Scientific studies also prove milk protein consumption helps improve metabolic health, boost cardiovascular function, and regulate blood sugar levels. We’re not surprised one bit. Milk protein is an incredible source of the mineral calcium, which plays a vital role in heart health. If you’re keen on buying a solid milk protein supplement, try PEScience SELECT Protein. We’re also stoked MuscleTech PHASE8 has milk protein. It’s a old school and sure-fire way of getting your protein fix. MuscleTech PHASE8’s sixth protein source is calcium caseinate. This is a slow-absorbing form of protein which comes from the insoluble portion of milk. It also undergoes extra processing. Experts believe it’s the most inferior kind of casein protein on the market. Nonetheless, calcium caseinate is roughly 90 percent protein and is rich in the versatile amino acid l-glutamine (the body’s most abundant amino acid which helps preserve muscle mass, increase human growth hormone levels, and improve gut function). While calcium caseinate has potential as a muscle preserver, we give micellar casein the nod. It’s still the best form of casein available on the market today. Micellar casein is the seventh and last protein source of MuscleTech PHASE8. It boasts of approximately 90 percent undenatured protein. It’s also teeming with l-glutamine and branched-chain amino acids (BCAAs). In a nutshell, micellar casein is the end product when manufacturers separate casein protein from lactose and whey in milk. It’s the slowest-absorbing form of casein (slower than calcium caseinate). Expect micellar casein to feed your muscles for up to eight hours after consumption. “Muscle protein synthesis rates are particularly low during sleep, even when 20 g protei is ingested immediately after exercise performed in the evening. Protein ingested immediately prior to sleep is effectively digested and absorbed, thereby increasing amino acid availability during overnight sleep. Greater amino acid availability during sleep stimulates muscle protein synthesis rates and improves whole-body protein net balance during overnight recovery,” per the November 28, 2016 issue of Nutrients (via NCBI.NLM.NIH.gov). On that note, chugging on a micellar protein shake an hour or so before bedtime should reap enormous fitness dividends. Remember, your body releases human growth hormone (HGH) during sleep. Adding an extra micellar casein protein punch should help immensely. If you’re a hardgainer, supplementing with micellar casein is a must. 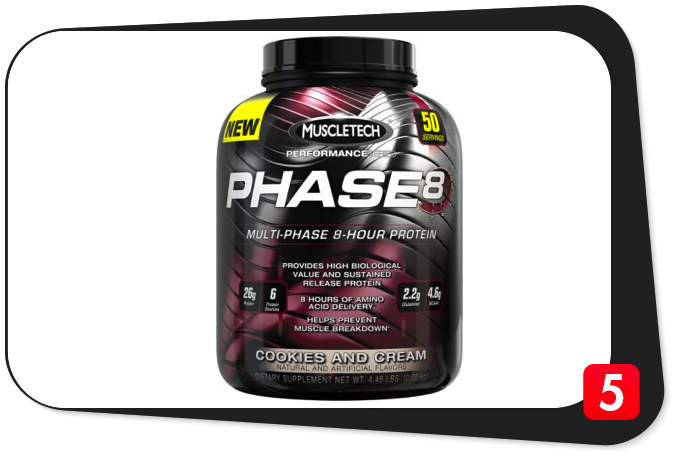 Buying a sustained-release protein supplement such as MuscleTech PHASE8 should help you achieve your fitness goals. Calories, 160: Your average protein supplement yields around 100 to 150 calories per scoop. MuscleTech PHASE8’s Milk Chocolate flavor’s 160 calories per serving is slightly above the industry average. Calories from fat, 15: MuscleTech PHASE8 is a low-fat supplement as only 15 calories come from fats. Total fat, 1.5 g: This protein supplement’s paltry two percent of the daily value for fats represents a low value. Saturated fat, 1 g: MuscleTech PHASE8 is also low in saturated fats at a measly five percent of the daily value. The American Heart Association urges the general public to monitor its saturated fat intake for better long-term cardiovascular health. Cholesterol, 50 mg: This is the first red flag we spotted. MuscleTech PHASE8 is high in cholesterol at 17 percent of the daily value. Paying attention to one’s cholesterol intake bodes well for long-term cardiovascular function, per the American Heart Association’s official website. Unfortunately, this product’s cholesterol content is a bit too high for our liking. Total carbohydrate, 8 g: MuscleTech PHASE8 has a scant three percent of the daily value for carbs. This supplement complements any low-carb nutrition plan perfectly. Dietary fiber, less than 1 g: This product is not a significant source of dietary fiber at a measly four percent of the daily value. Sugars, 1 g: While MuscleTech PHASE8 has low sugar content, we don’t like its sucralose inclusion. It’s an artificial sweetener which has links to obesity and other side effects. Stevia, a natural alternative which helps regulate blood pressure and blood sugar levels, would’ve been the far better option. Protein 26 g: MuscleTech PHASE8’s 26 grams of protein per 42-gram scoop represents a gaudy 52 percent of the daily vale for this macronutrient. Better yet, it boasts of seven different kinds of protein which give you a sustained-release anabolic edge. It doesn’t just get any better than that. Calcium, 472 mg: Besides its sustained-release eight-hour protein formula, MuscleTech PHASE8’s other biggest strength is its calcium content. If a solid 47 percent of the daily value doesn’t grab your attention, we don’t know what will (only the likes of Bodybuilding.com Signature Casein have higher calcium levels). That much should help strengthen bones, regulate blood pressure levels, and shore up cardiovascular function. Iron, 0.94 mg: MuscleTech PHASE8 is not a significant source of calcium at just five percent of the daily value. Sodium, 910 mg: This supplement’s nine percent of the daily value for sodium represents a moderate amount. This much should help ward off muscle cramps, maintain an optimal fluid balance, and enhance cognitive function without making your blood pressure levels skyrocket. Papain, 50 mg: This digestive enzyme and papaya fruit extract helps break down protein for better overall results. Amylase, 50 mg: This digestive enzyme helps break down carbohydrates for better overall results. On paper, the so-called “Complete Sustained-Release Eight-Hour Protein Formula” looks impressive, to say the least. If you’re a hard-training bodybuilding enthusiast, it’s hard to pass up on seven different protein sources for maximum muscle growth. It’s just what the doctor ordered. First off, an impressive 26 grams of protein per 42-gram serving should help increase muscle protein synthesis, fill nutrition gaps, and meet your daily protein requirements. You can’t go wrong with 52 percent of the daily value for protein. MuscleTech PHASE8’s whey protein concentrate (WPC), whey protein isolate (WPI), 97 percent whey protein isolate, and whey protein hydrolysate (WPH) components will help you make that transition from a catabolic state to an anabolic one after a tough workout. Bear in mind whey protein has a fast absorption rate. The inclusion of whey protein hydrolysate ensures this supplement feeds your muscles at warp speed. As for the slow-absorbing protein components, MuscleTech PHASE8’s milk protein concentrate (which also has 20 percent whey protein), calcium caseinate, and micellar casein components should help you preserve hard-earned muscle mass and remain in an anabolic state for up to eight hours. Like we said, we’re not sold on calcium caseinate – it’s not as time-tested as micellar casein. However, MuscleTech PHASE8’s calcium caseinate’s component is a big reason why this supplement is teeming with calcium (47 percent of the daily value). Few protein powders measure up in this regard. We’re certain this product’s calcium content will help boost heart health and strengthen bones, among other things. Let’s also not forget about this product’s 5.6 grams of branched-chain amino acids and five grams of l-glutamine per scoop. Expect more fat loss, increased muscle protein synthesis, better gut function, and improved muscle preservation as a result. We also like MuscleTech PHASE8’s low fat (two percent of the daily value), saturated fat (five percent of the daily value), carbohydrate (three percent of the daily value), and sugar content (one gram per 42-gram serving). These bode well for long-term health, for sure. The inclusions of 50 milligrams each of papain and amylase were a stroke of genius. These are sure to help break down MuscleTech PHASE8’s protein and carbohydrate components, respectively. Kudos to the manufacturer for that. The company also does a stellar job in terms of transparency – it reveals all of the ingredient amounts. You won’t find any shady proprietary blends in MuscleTech PHASE8. In terms of customer reputation, this supplement has enjoyed a good one to date. Consumers have given it high marks over the years. They say it has given them good results. However, a few customers say the taste and consistency are off the mark. As for us, we say the taste is good, but it could be a tad better. On the flip side, MuscleTech PHASE8’s first glaring chink is its high cholesterol content (17 percent of the daily value). If you’re monitoring your cholesterol intake, better steer clear of this protein supplement. As much as we hate to say this, MuscleTech has a reputation of including fillers in its supplements. Unfortunately, the trend continues with MuscleTech PHASE8 – it has sucralose (an artificial sweetener with links to obesity) and carrageenan (a food additive with ties to carcinogenicity). Had it not been for these, we would’ve given this product a higher grade. The key takeaway: MuscleTech PHASE8 is an impressive yet flawed time release protein supplement. We feel it’s an oxymoron which describes this product perfectly. If the company can keep its cholesterol levels in check and take out the fillers sooner than later, that would be great. We agree with all of these claims. MuscleTech PHASE8 is a protein supplement which should help give you an anabolic edge, and then some. The manufacturer intended MuscleTech PHASE8 for healthy and active individuals who want to increase and preserve muscle mass, fill nutrition gaps, meet their daily protein requirements, and achieve their daily fitness goals. MuscleTech PHASE8 has 17 percent of the daily value for cholesterol, which is a high amount. It also contains sucralose and carrageenan – ingredients with ties to obesity and carcinogenicity, respectively. If these, or any other ingredient, make you feel doubtful, please consult your doctor before buying MuscleTech PHASE8. Sustained-release eight-hour protein formula. Harnesses the powers of seven different kinds of protein. Twenty-six grams of protein per scoop. Represents a gaudy 52 percent of the daily value for more muscle mass. Solid calcium content. Gives you 47 percent of the daily value for calcium for stronger bones and better heart health. Five grams of glutamine per serving. Most abundant amino acid which helps preserve muscle mass and ramp up HGH levels. 5.6 grams of BCAAs per scoop. These help increase muscle protein synthesis and fat loss, ward off fatigue, and keep muscle soreness at bay. Low in fats, saturated fats, carbs, and sugar. These bode well for long-term health. Digestive enzymes. Papain and amylase help break down protein and carbs, respectively, for better overall results. Good reputation. Customers have given this supplement fairly high marks online. Flavor options. Comes in Milk Chocolate, Strawberry, Vanilla, Cookies and Cream, Peanut Butter Chocolate, and White Chocolate versions. High in cholesterol. Contains 17 percent of the daily value for cholesterol. Fillers. Has sucralose and carrageenan, two ingredients with links to obesity and carcinogenicity, respectively. MuscleTech PHASE8, the so-called “Complete Sustained-Release Eight-Hour Protein Formula,” has a lot of things going for it: high protein content, seven different kinds of protein, five grams of l-glutamine per scoop, 5.6 grams of BCAAs per serving, and high calcium content. It is indeed a powerhouse protein supplement. Unfortunately, its high cholesterol and filler content pull its value down. Nevertheless, we recommend you buy it (with some reservations). It bears repeating: we’re clamoring for a cleaner version sooner than later.